The instrument consists of a nocturnal on one side and the 'organum Ptolemai' form of altitude sundial on the reverse. The outermost scale on the nocturnal base-plate has four divisions for each quadrant marked '[cross]', '1', '2', '3' and '31/2', giving corrections to be applied to the measured height of the Pole Star to yield the altitude of the Pole, i.e. the observer's latitude. This scale is used with the nocturnal held vertical and the index arm coinciding with Ursa Minor. Moving in from this scale is a zodiacal calendar, each sign indicated by name and symbol and divided to 30 degrees, the months indicated by Latin names and divided to days. There is also an inner solar declination scale, divided 0 to 23 to 0 to 231/2 to 0. Above the base plate the first volvelle plate has a scale of hours 4 [pm] to 12 to 8 [am], divided to quarter hours, each hour marked by a tooth, and with an extended index arm at 12 serving both to set the hour scale to the date and to read across the zodiacal calendar. The hour plate has an inner scale of numbers marked 'Epacte Anno. 98' for calculating the date of Easter, together with a second, inner volvelle-plate marked with hours 1 to 24, each hour marked by a tooth, including an extented one at 24. The index arm held by the central pierced rivet is engraved, 'Quadrang. vrse minoris'. The sundial side has a latitude scale, 0 to 90 twice, divided to 1, numbered by 10. Set by this scale, by means of two polar index points (one marked 'Polus arcticus') connected by a line marked 'Axis mundi', is a volvelle plate carrying a Rojas projection of the celestial sphere between the tropics. The projection grid has parallel lines for solar declination at ten-day intervals, with zodiacal symbols, crossed by curved hour lines, numbered 11 to 1 'Hore ante meridien' and 1 to 11, 'Hore post meridien'. The 12 o'clock meridian line is at the circumference of the circle. A sighting rule and right-angle index pivot together around the pierced rivet. The instrument is signed on the reverse of the index 'Michael Coignet fe'. Each side of the handle is engraved with city names and latitudes. 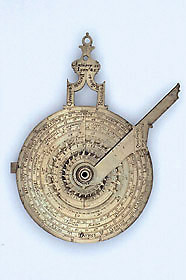 The instrument was acquired with the Lewis Evans Collection (Lewis Evans G. 78) and is described and illustrated in J. Bennett, The Measurers: A Flemish Image of Mathematics in the 16th Century (Oxford, 1995).